Just a note, this article was written in early 2011. If you are not familiar with A Thomas Jefferson Education, the Traits of a Statesman are: virtue, wisdom, diplomacy, courage, inspires greatness in others and moves the cause of liberty. In recent months, there have been several videos posted on YouTube and showcased on News Reports of brutal beatings and deaths occuring while people are watching, videotaping, and doing nothing about it. The most widely known is the transgender woman beaten in a McDonald’s while the employees did nothing. In fact, one employee warned the women perpetrators to leave before the police arrived. The most horrific I’ve seen is a young father, about to become a father for the second time, in New York to visit relatives. As he is standing on the corner talking on the phone he is gunned down by a man so close, you can see him in the surveillance. It turns out, it was a case of “mistaken identity,” the reason for the murder. And yet, on the surveillance tape there are no less than five people interested in what happened, but for the first two minutes NOT ONE PERSON checks him, talks to him, calls 911, comforts him…he lays on the cold pavement, dying. His mother saw the video and could not believe that not one person helped him. Is this who we are as a nation? Is this our level of courage? Compassion? 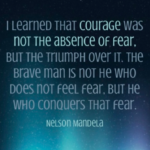 We all would like to think we can be courageous in the face of fear. What would you have done in that situation? Courage IS a muscle that needs exercise. It takes a little courage, every day. The idea that you shouldn’t “get involved” is simply an excuse to bury your head and forget what we are responsible to LOVE our neighbor as we love ourselves. I went downtown for a tax day “Tea Party” a year ago. As I was waiting by the Capitol building waiting for my ride, I heard an incredible crash. I looked over and two young men were climbing out of a car. I ran as fast as I could the 100 feet to help. One man who had exited the car kept walking, he was bleeding from the head and disoriented. I screamed to “call 911″ and another man started helping the second man while I attended to the first. He didn’t want to sit down, and I grabbed his arm and told him he has to sit down. I called another man over to help me. I whispered to the helper “He’s been drinking, he could have serious damage and is obviously in shock. Please help me sit him down.” About four of us finally sat the two men down and the police arrived, as did the ambulance. I didn’t think about it at the time, I just knew I had to help. I didn’t notice who didn’t help, that wasn’t important to me. I also didn’t think about the fact I was almost five months pregnant. Was it courageous? Not really. There wasn’t any real imminent danger, but I’d like to think that I exercised my muscle that day, and that if I need it in the future, it will be strong. What courage will you display today?